The “Green Movement” of the 21st century has caused changes in nearly every corner of the world. Large-scale things from the eventual eradication of coal and rapidly growing use of renewable energy sources, to smaller things like fast food companies doing away with plastic straws, eco-consciousness is now at an all-time high. When it comes to the automotive world, this is probably more pronounced than anywhere else. Hybrid technology has exploded in the last twenty years. The carbon footprint left on this planet by cars has been called into question from all corners of society, and the automotive world has responded. Cars, trucks, and SUVs are more environmentally responsible than ever before. One of them, the 2019 Chevy Volt, is particularly well known for its environmental impact. But that’s not all it’s known for. Introduced in 2011, the Chevy Volt is already the best-selling American hybrid car in the world. With its ability to go up to 420 miles with a full tank of gas and a full electric charge, the 2019 Chevy Volt is poised to continue the tradition of being a high-quality hybrid vehicle. However, it isn’t just a hybrid vehicle. With its streamlined curves and high-tech features, it is also a highly sought after vehicle, regardless of its admirable impact on the environment. Below, we will check out the 2019 Chevy Volt’s engine, its interior appointments and the two trim levels, the LT and the Premier. Once you’ve seen exactly what this hybrid has to offer, come on over to Carl Black Chevrolet in Nashville and see one of these groundbreaking vehicles in person. 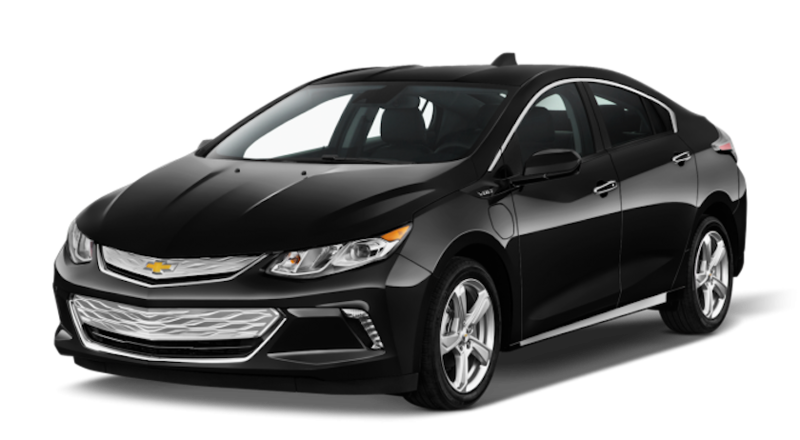 As a gasoline powered engine, the 2019 Chevy Volt is a 1.5 liter inline four-cylinder engine, capable of attaining 149 horsepower and 294 lb-ft of torque. That is a very respectable engine for such a relatively small vehicle. It offers a very smooth and pleasant drive. Additionally, the 2019 Chevy Volt has lowered what little engine noise was found in previous year models, making for an exceptionally silent ride. The engine noise, or lack thereof, is a major selling point for many potential hybrid buyers. After getting behind the wheel of hybrids such as the Volt, many drivers find that they didn’t even realize how loud some other gas engines can be. The 2019 Chevy Volt is remarkably quiet, to the point you have to actively listen for its purring. As stated above, the 2019 Chevy Volt can get up to 420 miles on a full tank of gas and a full electric charge. This includes 53 miles alone on electric power, which is the best range among all plug-in hybrids on the incredibly saturated hybrid market. For drivers who live, work and play entirely within Nashville, that means you may never have to touch your gas tank at all. The 2019 Chevy Volt also takes advantage of a newer technology called regenerative braking. When the brakes are applied on any vehicle, that generates a lot of energy. Regenerative braking takes that energy and applies it to an electrical charge to the batteries. This is one way that the batteries in the 2019 Chevy Volt have such a long life. Additionally, the batteries for the 2019 Chevy Volt are located underneath the back seat, as opposed to in the trunk as in many other hybrid models. While this may make for an uncomfortable seat for an adult riding middle in the back seat, it allows for full use of the rear cargo space in this particular hatchback. So, if you are the grocery shopper in your household, you don’t have to worry about not being able to fit all your fruits and veggies in the trunk. You’ve got more than enough room. What is under the hood of the 2019 Chevy Volt is not the only impressive high tech machinery on this hybrid. It also features an 8” touchscreen standard on both trims, which is extremely simple to learn and use. Additionally, this interface is configurable for different drivers. So, if you prefer to have the sound system to be your go-to on the touchscreen, that can be easily accessible. If your driving partner prefers other infotainment features as readily available, that is also doable. Some of the available features on either trim are blind spot warning, which gives an audible noise and a flashing light if you are encroaching into another lane and do not see another vehicle that is in your blind spot. This allows you to make a correction and avoid a potential wreck. Forward Collision warning is another safety feature available. This will alert the driver of an impending collision with another car or object, when at lower speeds. Lane Departure Warning warns the driver if he begins to veer out of his lane. Auto-Parking Assist, which helps the driver fit into tight or difficult parking space, is also available. Additionally, Navigation and a premium Bose sound system come standard on the Premier trim. These are only a few of the many tech features available on the 2019 Chevy Volt. To learn about more, come and ask our sales staff at Carl Black Chevrolet. We’ve got a whole long list for you to go over. There are only two trim levels on the 2019 Chevy Volt, but they both feature plenty of advantages, both inside the vehicle and outside. The base trim level, the LT, features LED headlights and taillights, which maximize visibility at night or in adverse weather. It features a 60/40 split rear seat which can be folded down to greatly increase the 10.6 cubic feet of space offered in the trunk and take full advantage of the back seat space. Standard on the LT trim is Android Auto and Apple CarPlay. No matter where you lie in the never-ending Android/Apple debate, the 2019 Chevy Volt can adapt to your smartphone and allow you to access apps on your phone through your car. A Comfort package with the LT features a leather-wrapped steering wheel, heated front seat and heated mirrors. The Premier trim, as its name suggests, is the higher end option on the 2019 Chevy Volt. In this vehicle, you get all of the perks of the LT and its optional Comfort Package, as well as an 8-speaker Bose surround system, heated rear seats, and automatic parking assist. Again, these are just a few of the perks available on these two trim levels. The major difference between these two trim levels, however, is the charging port. On the LT, the charging port is 3.6 kWh, which fully charges in about 4.5 hours. While that is perfectly fine when you are at home overnight or at work for an 8-hour day, it can be frustrating and costly if you wish to have a full charge when out and about. The Premier comes with a 7.2 kWh charging system. That is double the charge going into the 2019 Chevy Volt, which, in turn, cuts charging time down to about 2.3 hours. When you are in public and paying per-hour charging fees, that will save a lot of money in the long run. The 2019 Chevy Volt promises to uphold the tradition, and outstanding sales figures, of past generations. The hybrid revolution is still very much alive, and this car will be at the forefront for some time yet. Starting at $33,520, you can see why this hybrid hatchback sedan is so popular. Disregarding the fact, for a moment, this vehicle’s impact on our environment, it is still an impressive piece of modern technology. It has just about everything you could want in terms of safety and infotainment in a car. It has plenty of room for four passengers, five if you have that one friend that will volunteer to sit in the middle of the back seat. It has a smooth, quiet ride, which is ideal for living in a city like Nashville with plenty of live music on every street corner. However, the 2019 Chevy Volt is a hybrid car. And, clearly, Chevy is quite proud of that. With best in class fuel economy and the fastest charger on the market, the 2019 Chevy Volt is ready to fly off lots all over the world. Don’t miss out on your chance to own one. Come down to Carl Black Chevrolet on Murfreesboro Pike in Nashville. Our sales team will give you a tour of the LT or Premier, or even both. These dedicated professionals know the ins and outs of all the vehicles on our lot, and we pride ourselves on giving you the best possible experience. When you’ve made your decision, our finance staff is here to walk you through the steps of financing a new vehicle, whether it is buying or leasing. If you can’t make it down while our showroom is open, our virtual showroom is open 24 hours a day. Check out the 2019 Chevy Volt or any other Chevrolet vehicle that catches your eye.